Thus, the Plant has proved its right to enter the prestigious base of the International Aerospace Quality Group (IAQG) OASIS. The OASIS database includes only significant and reliable suppliers for the worldwide aerospace industry. The main reason to be included in a prestigious base is the compliance with the requirements of Aerospace Industry International Quality Standards, which are being developed by the IAQG. IAQG members are the largest manufacturers of aviation machinery and equipment in the world, such as Boeing, Airbus, Embraer, Bombardier. The compliance with the requirements of the EN 9100 standard allows plants to be a reliable link in the chain of aircrafts or rocket-and-space aircrafts production. In particular, the “Oscar” Ukrainian Plant can supply seamless stainless steel pipes, titanium and nickel alloys to the largest aviation concerns of the world. These products are used in the manufacture of aircraft engines, hydraulic systems, aircraft fuel-supply and oil lines. scientific and technological progress and an increase of customers’ demands for quality. In case production cannot prove its ability to meet the requirements of the standard, the certificate shall be revoked and the company ceases to be considered modern and reliable in the world market. The company remains in the database if it meets the latest requirements. In particular, the Ukrainian “Oscar” Plant has been included into the OASIS database since 2012 and every three years confirms its compliance with international standards and annually undergoes supervisory audits. “The “Oscar” Plant in Nikopol is currently capable to supply the world’s largest aviation companies with its products. 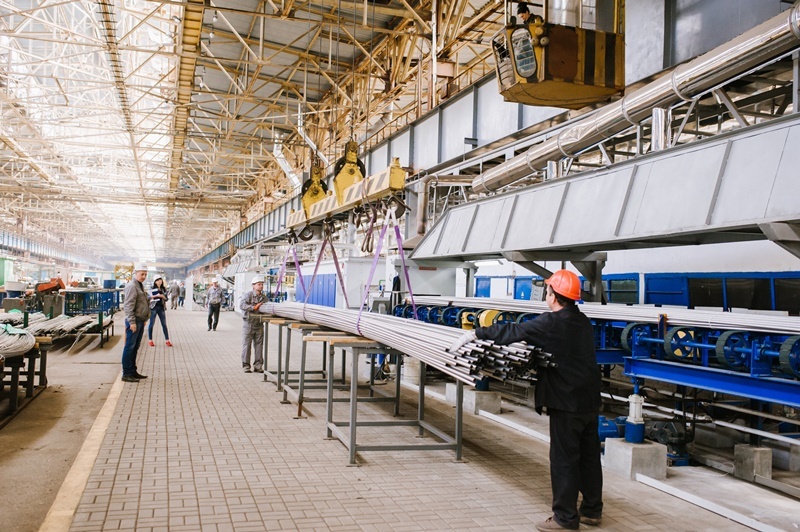 Now the Plant’s production volumes are increasing: in 2018 the Plant increased its production of seamless stainless pipes by 20% compared to 2017”, Anatolii Khaietskyi the Plant General Director said. Production growth is associated with large-scale modernization of equipment at the enterprise, which is still ongoing. From the very beginning of 2019, new rolling mills have been prepared for installation at the Plant, which will almost double the rolling production capacity.